"After discharge, we started feeding the child nutritious food combinations." This article was written by Simon Peter Esaku and originally posted on http://beyond5.org/2016/03/30/a-new-potato-fights-malnutrition-hunger-and-poverty/. World Vision partners with organizations such as USAID and Harvest Plus to seek a hunger free world by helping farmers learn to grow, harvest, and sell sweet potatoes rich in vitamin A. These programs are featured in a new book by Roger Thurow titled, “The First 1,000 Days.” In Uganda, 38% of children under 5 are vitamin A deficient, contributing to stunting, susceptibility to disease, and insufficient immune response. By gaining access to vitamin rich potatoes and other vegetables to grow, eat, and sell, families such as Emmanuel’s are finding hope for a brighter future. “His skin color turned yellow, and his hair became sparse and brown,” says his father, Martin Aroma, 29, at home in Onyapoyere village in northern Uganda. Emmanuel was referred from the village to a series of four health facilities, finally staying at Lacor Hospital in Gulu, about 37 miles away. “The doctor in Lacor diagnosed [that] Emmanuel was lacking vitamin A and iron, so he gave Emmanuel vitamin A tablets and iron tablets,” says Martin, who spent one month with his son in Lacor Hospital. Making sure Emmanuel didn’t get sick again required more than supplements though. It meant changing the foods he ate so he got the proper nutrients. Fortunately, Martin had grown orange flesh sweet potatoes at his home in Onyapoyere. The orange flesh sweet potato — rich in vitamin A — was developed by the International Potato Center and the National Agriculture Research Organization. “I got 30 kilograms (66 pounds) of the orange flesh sweet potato vines and two kilos (four pounds) of high-iron beans from World Vision in April 2013,” Martin says. From the vines, he planted a quarter acre of the sweet potatoes the same month. Martin and his wife, Harriet Adong, 24, nourished Emmanuel with the orange flesh sweet potatoes. In 2012, USAID began funding a five-year project partnership between World Vision and Harvest Plus. Simpson Bryahbaho, project coordinator, says the effort aims to reduce micronutrient malnutrition and improve dietary intake of vitamin A and iron among 105,000 households in northern Uganda. “I had already learned to make nutritious food for children in a World Vision training,” Martin says. It was that project that provided the first vines, high-iron beans, and training to 325 farmers, who were organized into 13 groups in Minakulu subcounty. These sweet potatoes have turned out to be a food not only for good nutrition but also for food security and income generation. 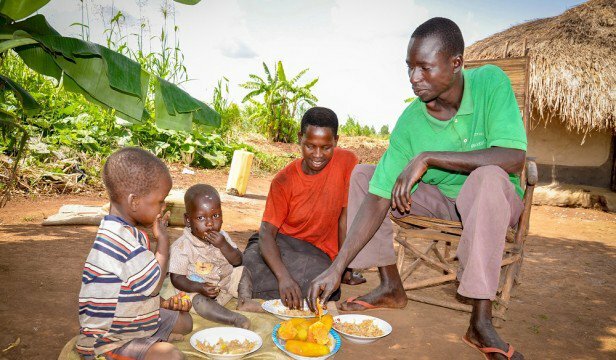 The orange flesh sweet potatoes have saved children like Emmanuel and Martin’s second son, 18-month-old Oscar, from malnutrition and hunger and blessed their homes with more income. Photo: Martin Aroma, 29, and his wife, Harriet Adong, 24, and their two children — Oscar Otim, 18 months, and Emmanuel Ojede, 3 — eating a meal of orange flesh sweet potatoes at home. ©2015 Simon Peter Esaku/World Vision.